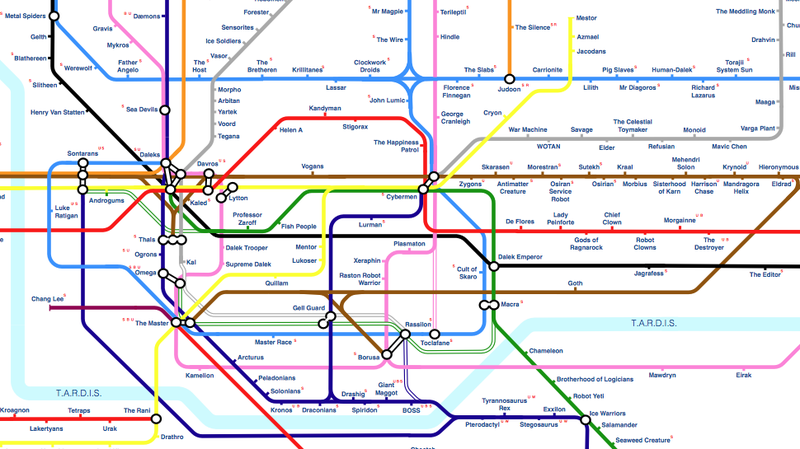 Crispian Jago represents the Doctor's multi-threaded history as a Tube map, with one transit line for each of the eleven doctors, and the various characters and aliens the Doctor encounters as stops. Daleks are pretty much the ultimate cosmic transfer station. Head over to Jago's site to see the complete interactive map—and be sure to mouseover the various Doctors and transfer stations. Conveniently, the individual names on the chart are linked to the TARDIS Data Core wiki, so you can brush up on your Whovian creatures. Jago created this particular map in 2011, however, so it's not quite up to date on Matt Smith's run.